We can see that the solar-inspired speculative mania effectively ended in that window of mid-year 2014, with stocks making a topping process between then and May 2015. Daily geomagnetism reveals an intensification in recent months. Something similar happened in 2000. Stocks were led into a 2 year bear. Back to the current, the overdue snap in equities in August 2015 changed the picture. No V-bounce like in 2013-2014, plus a sharp escalation in complacent indictors. This is not like those 2013-4 corrections. Various indicators which were stuck at bullish extremes in 2014 have now not only mean reverted but have moved all the way to bearish extremes. Amongst these are Investors Intelligence bulls, US equity outflows, capitulative breadth, Trin and a cluster of 90% down volume days. Collectively they represent bear market bottom readings, leading some analysts to call time on the current the correction in equities and predict a bull market resumption. In that scenario we need to square why stocks only corrected 10%. In the first chart at the top we can see a year long stealth bear in progress, more apparent in some markets and indicators than others. So did stocks correct in time rather than price? Proponents of that option then have a problem with big picture indicators, in that both valuations and leverage are still a long way from mean reversion. Due to the lack of demographic tailwind, the bull mania was fuelled by debt: traders leveraging up and companies leveraging up to make buybacks. For the bull market to continue, both those would need to rise to new record highs. Given the sharp snap in equities in August, the appetite for that is likely absent, at least for some time. Rather, in my opinion, that was the point at which the mania popped, at which record complacency and froth was finally shot down. 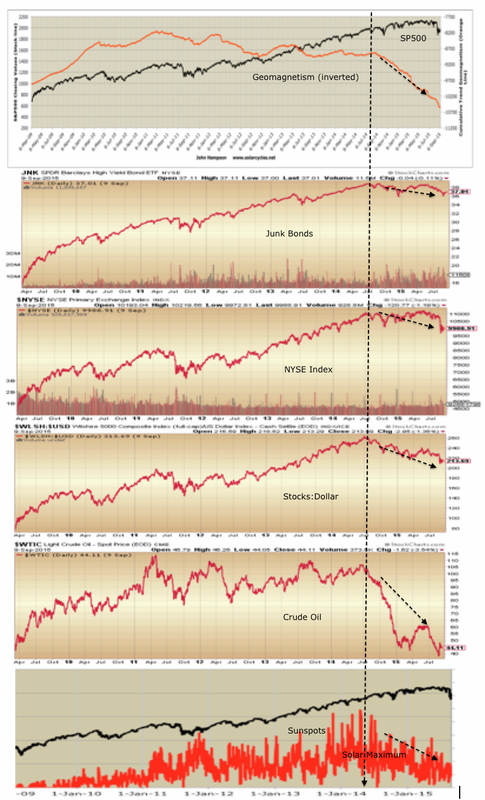 The bear market bottom readings in certain indicators are indeed a sign of a bear market: a pause in the downdraft. 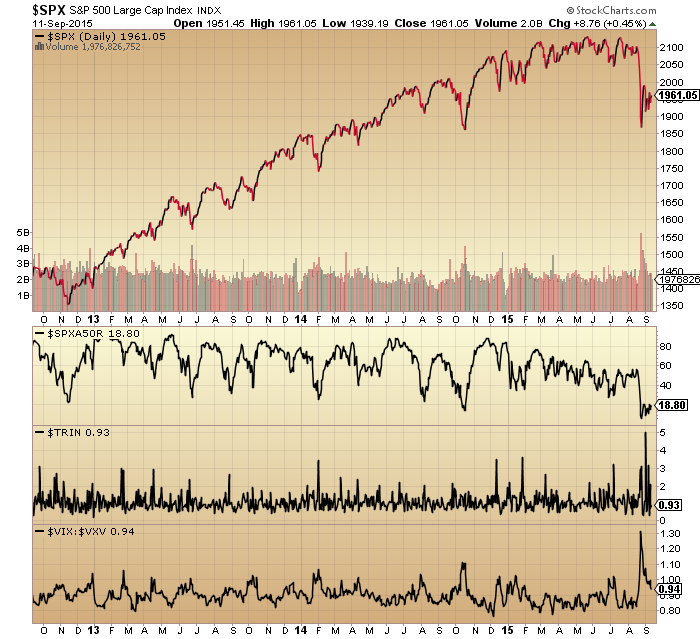 These indicators show selling and fear and are only bullish if they revert. Case in point: in 2014 they were stuck at extreme bullish and did not revert, hence stocks continued to edge up. The question is why they were stuck at record bullish extremes, and the answer is the hidden force of the solar maximum. Now we have the twin powers of waning sunspots and intense geomagnetism, which are likely to keep these indicators bearish. There is a common misperception that the economy (i.e. recession) causes bear markets, but the data in fact shows that the stock market leads the economy. Rather it works like this: demographics and sunspot cycles bring about the major peaks and troughs. In our current case, the rise into the mid-2014 solar max caused the speculative mania in the markets, identified by extremes in valuations, sentiment, allocations and leverage. Then the wane from the solar max and associated intensification in geomagnetism have brought about the burst. That burst isn’t complete until valuations and leverage have reverted sub-mean, a process that is already fixed in demographic and solar trends right ahead. October is the seasonal peak intensity for geomagnetism. This is the reason for a cluster of major historic drops to lows in October. We are finely poised leading into it. Stocks have made a triangle consolidation following the August drops. Gold has a weak higher low, as a tentative basing. For equities a retest of the August lows would be historically normal following such sharp drops, whether bull or bear bigger trend. 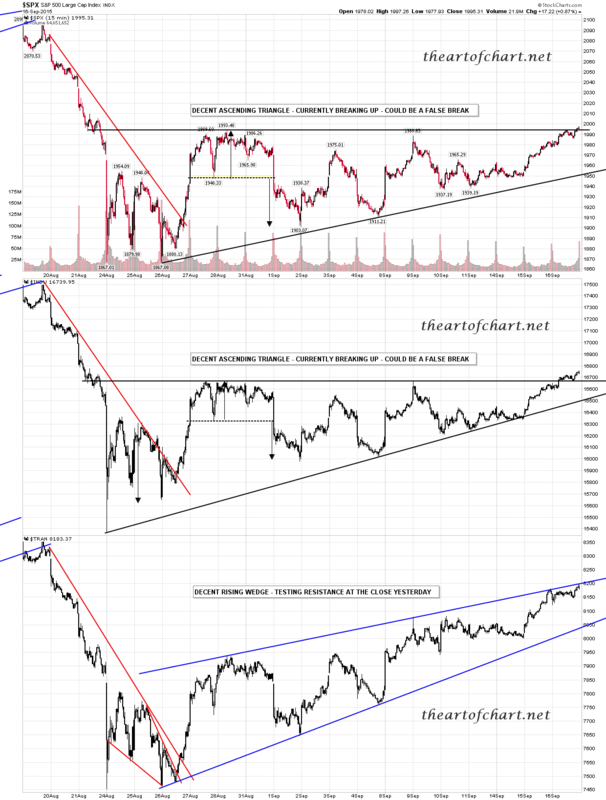 But, various indicators are already at bearish extremes, i.e. contrarian bullish, so we could move further sideways or upwards before heading down again. Friday was the new moon, so we are now tipping over again into negative pressure, and this is assisted by current raging geomagnetism. FOMC and OpX this week. My view. Stocks are in a bear since May 2015. That means no new highs and another lurch down lies ahead. Given the collective shock at the August drop in equities – despite 40+ topping indicators forming last year – another leg down to lower lows would have a major effect on the masses. If indicators can’t pull up now from their current extreme bearish readings, then that’s the recipe for another sharp break downwards in the current geomagnetic environment. Odds are this can transpire as we move into October. Invalidation would be stocks holding up through this window, gold breaking down, and equities indicators pulling away from bearish levels. What Causes Bear Markets And Recessions? Last week I hoped that the market would resume its decline in order to influence approaching FED decision. Apparently last Friday this opportunity window was closed. The market can’t go down right before the FED. The leg down in Europe on Friday was on very small volumes driven by the US futures during only European session with risk-on stocks recovered in the second half of the day. Usually it happens when the market anticipate turn up in after. So, I think next week it will be moderately bullish into the FED with eventual spike after. FED wouldn’t like to break the market from one hand and to destroy its “forward guidance” from the other hand. So, the bullet may be in the middle. They may hike the rates but only by 0.10-0.15%. The market will be happy and ready for the next wave down when everybody is onboard the train. Good points Dmitri, I also think that we will spike this week, minimum SPX 200MA at 2070 comes into play. I would not exclude new ATH so 2007 scenario gets replayed. 2007 was also frigtening drop in August (after Bear Stearns) with secondary top in October. It did not make sense from EW pattern then, only later the picture became clearer. So probably Fed will hold the decision once again, biggets beneficiary may be gold. And USD will be the loser with USDJPY particularly vulnerable. It’s 2010 again for me – after the initial drop, markets levitated for what seemed like an age, but the May low was eventually taken out, as it usually is after such a sharp drop. The bearish picture is clearly seen on the Nasdaq, where we have retraced to the base of the prior up-channel, but been unable to retake it. As of Friday there is a clear daily sell setup there. High alert Sunday at the futures open. what do you mean by daily sell setup on Friday? Retest variation sell setup: a significant high (SH) (highest for 10 periods or break of prior spike high) followed by one or more lower closes and one or more higher closes that do not break the SH. Sell a break of the low of the final setup candle; initial stop loss somewhere at/above the high of same. Having said that, momo indicating correction may not be done yet. Japanese Yen usually rises when stocks fall. Below are the charts. 250-day line has been touched 3 times in the past 3 years. If Yen rises thru it, stock markets should be turned upside down. Excellent post, JH. If market follows the solar cycles, next four years should be different from previous six years. Thanks John. 9/13 is the end of the Shemita year. The last 2 times the market crashed to the exact day. I would not over look that astronomically impossible statistic. I believe your solar cycles line up with God’s prophetic calendar. The bear is here to stay. Zoe, what are the dates of the previous two ends of the Shemita year? What holiday or calendar reference marks the end of the year. Would like to add this holiday or calendar reference to my trading system. Thank you. How is PALs positioned for next week, Last week didn’t go as plan. I am thinking we bump up to 1990/2010 before we start a collapse. Will position accordingly. PALS was positive last week and I was fully invested, market went up; how is that not going as plan? Summary: I am fully invested until Tuesday at close. From Tuesday at close will look to short or stay in cash. Can’t see any upside after Tuesday, and if so Thursday should be the zenith of price if Fed really dovish. September 13th will complete the seventh cycle of a seven-year Shemittah cycle in the 5775th year of the Jewish calendar. The last cycle of seven sets of seven years was 1966. The acceleration of the 26% drop in equities that year occurred as the Dow dropped through the 10% support that had held for seven weeks. The 10-Year T-Notes rose from 4.6% to 5.5%. Nine of the Shemittah cycles since 1900 have coincided with years when the Dow Industrials declined by twenty percent or more in the second half of the Julian calendar year. Two more saw hard breaks in the first half (37% in March 1938 and 17% in April 1980). This year’s July 8th low (4.8% from the high) should be watched closely. Support was evident around the 5% and 10% levels from June through September in the years that did not crash. The threshold for bad breaks in the second half of all Shemittah years has been 10%. Each break beyond 10% went on to decline by 20%+. Buying December put options over the next month with a strike price 10% below the year’s high would appear to be prudent insurance. I should add the report referenced above was penned on July 18, 2015. Really useful, thanks Gary! Will print this and add to reference book. At one minute past midnight may I be the first to wish you a happy birthday Gary. Do not hold your breathe for a gift. Good guessing, but all incorrect. Congratz to you sir Gary! I just meant it was not super bullish as I thought it would be..I was thinking it would cross 2000 but it didn’t. anyways will see what happens this week. Leading to FoMC is genrally +ve, rally will bring lot more buyers before they dip down. Agree entirely and get your point, last week was not up very much I guess I made one percent for risking my entire account on the trade. Whoops, wrong blog, lol. Apologies. What if…natural resource sell off last few years and weakness in all markets except US is a deflationary cycle that eventually brings US markets down substantially. As US has been the largest and most tradable market it was where money moved to escape the sell off in other areas. Hmmm…then all of JH’s posts and others are entirely correct on a longer term perspective. The question then becomes which market has bottomed first. My guess would be EWZ (Brazil). Resource economy with long history of market performance both stellar and otherwise. GDXJ or GDX seems obvious, however, slight chance that that industry may not recover due to systemic changes in monetary role of precious metals, middle class purchase cessation (buying 30 year mortgage and consumer goods instead of gold), and new materials science (graphene) which makes superconductive materials out of carbon. Maybe better phrased as ‘which will bottom first’. Agree that gold and its miners are the most likely. Brazil etc yet to really go through the mill. Commodities likely heading much much lower, oil to $20s. I like what you include in your analysis. What you say John, is that humanity is simply part of forces greater than itself, (a realisation you can also wake to at 4am.) Conventional trading and investment ‘skill’ is based on a memory bank of repeatable probabilities. Speaking for myself, I am allowing decisions to happen without taking credit for them, rather than expand an egoic bubble – less pain, more flow it seems. At one level our Intelligence is an expanded cosmic, abstract background field and witness to what happens. At the other end of the scale, the contracted mind is speculative, manipulative and mechanical – because it is limited, it mostly gets it wrong. Perfect summary of what trading success is a result of. Patterns repeating and profiting from the knowledge. I like that. All the tricks of the mind are survival mechanisms: illusory superiority bias, control illusion, optimism bias, confirmation bias, hindsight bias, self-serving bias. Peel them away through science and we see the kind of ‘dumb’ subjects of nature that we are. “Know thy self” –Oracle of Delphi. I’m pragmatic, so already thinking about relocating to the tropics somewhere, or Southern Europe, setting up a farm, trying to become self-sufficient. Not immediately, but within the next 10 years or so. Armstrong has an article on the subject today, and the associated conflicts/revolutions that come with food shortages. It’s useful to be aware of these issues, but sobering to consider that money alone won’t be enough to survive, let alone prosper, in the decades ahead. Thanks again to Gary for the information on the Shemitah cycle. There does seem to be an effect and the 1929, 1987, and 2008 market price decreases were substantial. Happy to contribute, Valley. Thanks. I am of the opinion that the Northern Hemisphere harvest low is in and that the Indian/SE Asia dryness evolving into drought will drive Ag prices much higher over the coming months and into next year. I am adding to my Ag futures longs. I am not in stocks in any account (stock or futures) at this time and I am looking to short US stocks at new ATHs for the major indexes in the coming months. I have a plan and I am sticking to it and working it. I have taken profits on my Sugar longs (one month to the day that I went long) and I am adding to my Soybean longs. There is no rain threat to Brazilian sugar areas which at this time is good for production as it won’t change polarization but there is rain threats to Thailand and lower India which is good for their production. In addition; there is a clear weekly pattern in Sugar of the last three weeks of lows early in the week and rallies late in the week. If rains do hit lower India and Thailand then attempts could be made by Large Specs to crash the market to new multi-year lows, early this week, to burn people like me and you. Even though I still think the long term “line of least resistance” is up in the short term it is down. I have nice profits anyway with better short term opportunities in the Grains. If the Grains start rallying then Ag Stocks are also going to start rallying (right along with the “financials” should interest rates rise) this week. I think the “line of least resistance” for US Stocks is up not down. What if the “truth” behind stocks topping out six months before the economy does is because it takes six months for the Smart Money to distribute to the Dumb Money. What if the “truth” is that if the Smart Money could distribute one month before the economy tops out that stocks would also top out one month before the economy does. Doesn’t it stand to reason that if it starts taking ten months for the Smart Money to distribute to the Dumb Money that stocks would top out ten months instead of the current six months? With all the corporate buybacks that have been going on for years perhaps it now only takes four months for the Smart Money to distribute to the Dumb Money meaning that stocks will top out only four months before the economy does. If this is the “truth” then the issue is when will the economy top out and how much lead time is needed for the Smart Money to distribute their holdings to the Dumb Money under current “market conditions”. First, thank you John H. For your analysis. Your presentations are always well thought out and researched. Very methodical and even kinda detached. Here is another chart from a great blogger at ponziworld. I don’t know anything about Elliot wave but I think there some pretty good e wavers here. Would one of you be so kind as to take a look at his chart and tell me what you think. TIA. Specie, without going into the principles of EW it would be difficult to give a clear answer. However in non EW terms the author is suggesting that we are at John H’s 2nd Chance right now whereas there are others (me included) who believe that we will have another drop from here which will be not ‘that’ far lower than the 24th Aug lows and THEN the 2nd chance will come. In vague EW terms its about the degree of the wave count rather than eventual direction which both camps see as down in a BIG way. Thank you Purvez. That helps to clear it up for me. That web page has an agricultural smell. I wonder that means? “If” the May heights was the believed six month lead time of stocks turning down before the economy turns down then the American economy must top and turn down by November. But if that six month lead time is still valid –and– the American economy is not going to top and turn down in November, but is still going to expand, then the May top was not the ATH before the “crash” and a new ATH is going to happen. This article along with today’s European manufacturing numbers and America’s ongoing recovery might be “why” Dr. Copper has been rallying of late. If so, then if the US economy won’t top out until July, 2016, then US stocks won’t top out until January, 2016, given the historical six month lead time of stocks over the actually economy. That means the ATH for the DOW is not in and anyone short will lose or need very deep pockets to ride out the losses until the turn is in. You really think Yahoo finance present a contrarian view on China? Really? The headline tells me it doesn’t. Seem to me that every man and his dog out there is expecting a bounce, a short squeeze, a rally of some kind. They wish. The Fed meeting this week is irrelevant in my opinion, whether they raise rates a little or not, the market has already spoken, risk tolerances have changed, interest rates ARE already rising as a result, LIBOR, SHIBOR, corporate credit spreads, all moving the wrong way if you want growth. The Fed is impotent and irrelevant, as it was during 2000-03, and 2008-09. The market will clear. Add to the mix the solar/lunar influences shared here, and it seems that down sharply is the way we will be going very shortly, and not just a re-test of the recent lows, but much lower. Looking to get short today/tomorrow. Does anyone know if Copper is the “Dr.” of the real economy or the false economy known as the stock market? How Copper ends this week, and performs next week, could be the real clue as to whether or not US stocks continue to crash or rally up to new ATHs. Let’s clear the air: We are on the verge of the best possible scenario for US Ag stocks: Good yields at good prices. US Ag stocks could perform better, with the El Nino, than Ag futures for the next six months –or longer. Throw in a rally of the financials (due to rising interest rates) and I just don’t see how US stocks are going to continue crashing in the here-and-now. ‘Even though I still think the long term “line of least resistance” is up in the short term it is down. I have nice profits anyway with better short term opportunities in the Grains. It’s nice to see that you agree with each other. AGs and farmers have just come off one of their best bull markets ever, 2000 to 2011. Another one so soon would be unique, historically speaking. Bear rallies are likely, but treacherous. Gann Global thinks like you and has picked several bottoms so far. A lot of 5 wave downs are showing up, which is long term bearish, but promising for a rally. One of many problems with going long in a bear market, esp in commodities, the 5th wave down can or is likely to be extended. The Grain’s Delta medium one point has brought in their long term low 5 point and for Wheat and Soybean they also brought in a super long term low point. For the past 16 years, each Soybeans Delta high long term 6 point has make a spike high with each higher than the one before. Soybeans is headed back up to another long term point 6 as a high and I expect it to be the fourth successive higher 6 point high for 16 years or four long term rotations which are four years long. In my opinion all the Grains made a high medium Inbetween point and point 1 as a low which means the odds for medium point 2 being a high is 85%. Anyone who knows Delta can easily see that a medium inversion window rally (crash upwards) is clearly underway for the Grains as can be seen by Corn’s and Wheat’s recent very strong rallies. This doesn’t happen very often and most Deltoids have wet dreams about catching such a rare bull market rally and here it is plan as day (if you have your eyes open and mind uncluttered). Ag is the notation for silver. Better using Agric for the meat & veg. Not to worry I also like silver from here. Richard, can you recommend some Ag stocks? Thanks in advance. Several months ago JH posted that he went long the AGs and if I recall correctly it was an ETF. Ask him. I hesitate to post this but the similarities between the 1999 and 2001 analogs in gold are striking similar; in terms of both price and time. Nothing is going to match perfectly; but if the lows recorded on Friday hold; bulls might be pleasantly surprised. Longer term EW still looks bearish however. A cinderella scenerio would look like at least one; possibly two new lows mostly in time but not price. Peter_ the reason I call for ‘elucidation on vague statements’ is precisely because they are vague….but in your case or also opaquely thus!! This essay from J Snider of Alhambra Partners explains something about the ‘wholesale’ banking system which I for one had no clue about. It also in corollary explains why the Fed are so ineffectual. Be warned its a particularly long piece and written in Jeffrey’s opaque style. We are living in unprecedented times concerning Money Supply. The FED is backed in a corner right now and really is in a damned if you do or don’t position. I think they realize that the experiment failed and I think the evidence is in their public statements that are so ridiculasly cautious to try and not break trust on either side. This has got to be one of the most interesting times I can remember in regards to the FED. As the Chinese curse goes, ” May you live in interesting times”. Interesting times being historical in nature and often bad times. The bottom line is Markets can only be manipulated for so long before they fail to yield to the manipulation and return to Market forces. We are possibly on this threshold right now. Cash is King for me. Indeed purvez, one of Jeff’s most interesting posts, gives one a whole new perspective on *money* itself. To utter the words ‘money supply’ followed by points re the Fed indicates the Snyder article hasn’t even been read, let alone understood. The Fed are irrelevant and impotent, having zero powers to control the actions of banks. The only thing manipulating markets is human speculative emotion, and its impending reversal. I don’t post a lot and I really enjoy reading the commentary on this board, glad I found it. I don’t know why this date keeps gnawing at me but with all of the events/announcements happening over the next 2 weeks I get a weird kind of bad feeling about tomorrow 09-15-15. Yesterday with Shemitah seemed really surreal, the weather here in Atlanta was ridiculously clear with very low humidity. It was the first day we have had like that, almost like the calm before the storm. US Nat Gas (UNG), seems to be consolidating and is not providing me the daily 1% trades I was hoping for. I still have my 2/3 trading volume and significant longer term holdings. However, consolidations are never easy to judge the up or down break. I will sell 1/3 of trading volume on an up break to $13.5 or above. I will buy any down break, but will assess the downward action prior to setting a buy level. My feeling is we continue to drift up or possible break up. Just to add a bit more info. I suspect the Nat Gas Weekly Injection report on Thurs. to continue the trend of flat to lower production and higher consumption. I expect the market is prepared for the moderate injections this week. If there is a surprise it will be a downside injection, which could lead to an upside price. However, the following week is not expected to be a high consumption report and could keep a lid on rapid upward price movements. Hence the upward drift potential. 9/14 11:09 Spiral update. Revised forecast via Lab 7442 ustream. 2042-2067 by 9/22. 515 is 5 of Wave 5. We haven’t gotten to 5 of Wave 1 yet. Peggy, isn’t 9/22 supposed to be a low because we’re now in the contraction phase of the spiral toward singularity on the 9/22? Also, Mar 22 was a high, so wouldn’t that imply that Sept 22nd would be a low based on 7442’s assertion that the spiral direction changed last weekend causing highs and lows to flip for the next 6 months when compared to the previous 6 months? yes, the change has to do with this pulse being “out of sync” with the background rotation. S&P range for all of March was @70 pts with the lows in mid March and end of March at @ 2050 – that’s the general pattern. The pulse is out of sync from 9/5 to 9/22, then moves back in sync to 10/9. This seems odd to me because synchronization is know ahead of time just as the pulse magnitude and direction is known yet on 9/2 this call was made “Spiral short term – 9/12 H, 9/23 L, 10/27 L, 11/20 L.” So based on what you’re saying now with the updated predictions, the forecast made on 9/2 didn’t look at the whole picture. Taking synchronization into account, Sept will prices changes will look something similar to March. Peter, thanks for posting your chart; along with the EW labeling. My take. Your ‘5=A’ I think is 3 of 3 or wave A. I see a triangle as wave B; which ended in the May-June 2014 time period. Jury is out for the final Wave C; which is difficult for me to determine. The $Gold take of wave C=50% of A points to $1063. The 50% retrace of the wave up to the ath is circa $1095. So the range has been visited once and now I doubt a lower low on the second dip. Note in the article that there are reports out of India that it is so dry in some areas that Farmers can not till the ground. A rising tide raises all boats: The American crop is large and if prices rally then the benefit to Farmers will be huge and that means not only the large American Ag markets such as farm machinery producers, seed producers, and fertilizer companies but REALESTATE. The spill over effect from a strong US Ag sector could be a shot in the arm for realestate nationwide. If so, then when will the US economy top out so that US stocks will top out six months sooner? July, 2016, which means that stocks top out in January, 2016? One thing seems certain, the Ag bull market won’t top out in November so that May confirms that it is the ATH before the crash. Will a bull market in the Ags and Copper benefit CAT and the rest of the DOW? Richard, CAT is a stock that I see has value today. A DIV in the 4% range and pretty solid in the base. I am watching closely to get back into CAT if we see a market panic in the next 6-8 weeks. I got out in the 100’s. There is a reason they put CAT in the cyclical CATegory. I love this stock for longer term trading. I am not buying now, but I do think you could buy at these levels. Thanks Richard for taking time out of your busy schedule to post these very educational posts. Your ability to clearly state your position in detailed coherent pictures makes all the difference. It helps to understand the big picture context with clarity in order to make reasoned judgements. Have the rules of supply & demand been re-written? A large crop (supply) would tend towards lower prices. Care to explain your thinking? Also, just a couple of weeks ago you were calling for an October peak in stocks, now, for various bizarro reasons, you are calling for May or January 2016 (it’s unclear). America will have a large crop. I am surprised that you do not understand that the Ags are international and not just American. It was reported yesterday that the dryness in southern Indian states is so bad that farmers can not till the ground. El Nino is pointing towards the best economic conditions for American Farmers in all history with a large crop and eventual high prices. In recent years both American and Argentine Farmers have expanded their storage capacities so that Large Specs are less able to cause then to panic sell their crops. Of course, American Farmers are damn well aware of what the El Nino is likely to do and will hold back their crops expecting higher prices for many months to come. This will result in the best American Ag market/profits in all history and will rally the entire sector which will spill over support to land prices helping to support and continue the “wealth effect” by both stocks and land prices going up. I was expecting Delta’s stocks six point rotation solution point 2 which is due in mid-October to the be the long term point that brings in super long term point 6 which is due in May. I have changed by opinion and now hold that an Inbetween point was the high six point rotation solution long term point that resulted in the May top and the recent crash was to a low point 2 that is early. It’s earliness as a low means the trend is still up and that also means I am now expecting point 3 due in January to bring in super long term point 6 as a new ATH before the Solar Cycle crash takes hold. No, I am not Martin Armstrong and I don’t even know or care who he is. This ‘wealth effect’ has as much chance of success as the ‘effect’ you were touting when oil prices fell out of bed. The US consumer in this *new market* would spend til they dropped. I wish you good luck, but there’s zero basis for your imagined causations. Boy am I glad im not the only nutjob who sees this type of behavior in the comments. This is why I think some comment beyond their means on John’s site. Ftse 100 just made a lower low and broke the bottom of its triangle, so I’m short at 6,048. Just attempted to add another short FTSE trade, but broker wouldn’t allow it, too close to close of the market (ETF 3x short vehicle). Will add more tomorrow morning. Today may be the best chance to get out of long. Tomorrow vix expires and they will pin it below 25 , after that it can rise. PALS is mixed at close today, with Phase and declination staying bullish until Thursday and distance and seasonals entering bearish close today. Based upon how high we go today I will move to cash or stay in until Wednesday’s close. Next week seasonals are negative…where do you short..wait till 2040 ?? Literally every man and his dog are waiting for a pop to that sort of level. I don’t see it myself, too obvious. I see down very soon, at least re-test the lows, probably lower. No one saw the first plunge coming either. Do I see 5 waves up from the low? I am still long SPX until Thursday afternoon fed announcement. If they say something market likes we would rally into Friday, I plan to fade this rally. Value stock picking that I am looking at if we get a down spike in the next 6-8 weeks. Most of these stocks I have sold in the past 18 months and looking for re-entry points. CCJ, STX, are current holdings. DE is a new potential that I have watched for years but mainly chose CAT instead. All are lower now than were sold at and I am still looking for lower. Core holdings are also lower, but I will never go to 100% cash. This is not my entire portfolio of course, but just what my interest is at this time. Oil update: As I have said this commodity is too hard to predict and I am not a buyer unless it gets into the 20’s, which I doubt will happen. Some interesting developments in this area. Saudi is quietly backing down production. Not a surprise, because they cannot produce as much as they were claiming to produce, they put up a big month, but now are backing down, the result will put them to their expected avg. of 11.5 Mbpd. US production is grinding to a halt. Wells being shut down in a crashing manner. Layoffs, a slashing of Capital Budgets and REAL damage being done. This is an area of cover up in the media. The news about Saudi being hurt and US winning the battle is not true. Saudi can handle the heat and US has everything to lose. Banks are seriously tightening up on the US producers. More thrashing and confusion to come on US markets as they struggle to survive. The silver lining is the US producers are working on their efficiency and an equilibrium will be found. It is very difficult to predict how the US market will look like at this time while they work with lenders on investments and the weak sell to the biggies and the stupid go bankrupt. In the end the US will have a great big faucet ready to be turned on as needed to keep prices in check. My stabilization point is in the $60-70 range for WTI sometime in 2016. More downward pressure between now and then is certianly possible, but a stabilzation now with a steady rise to the 2016 price range is certianly a possibility. Long term oil prices above $100 will be very difficult to achieve as long as US has this great big faucet to turn on when prices rise. Hmmm this triangle is doing what it HAS to do. Provided we don’t go over the Sept 9th high we are just finishing wave ‘d’ of this triangle. Wave ‘e’ needs to stay above 16170 to be relevant before we get the BIG push upwards. PLEASE PLEASE remember most of my triangle counts turn to DUST so keep tight stops if you are BRAVE enough to follow my meanderings. I’m going to be on a plane for the next 8 hours and then probably another 5/6 hours of recovery. I’ve placed a ‘down’ bet with the DJIA at 16600 with a stop above 16700…..THAT is a HUUUUGE stop for me but I’m hoping we don’t morph this triangle into something else. Safe travels p, have a good trip. Just you and me short it would seem, you with dusty triangles, me with…??? Me, I am holding my initial short, but will add some more tomorrow and again pre-Fed announcement on Friday. I may not get the top, but my average shorting price should produce some gains if the markets crumble as I am expecting after the Fed nonsense is out of the way. It won’t matter one iota what they do or say, the market it toast in my opinion, another big wave down lies ahead. Enjoy the next few days bulls, you’re all walking to a trap, and I doubt that many will be on board for the next leg down. Haha GM it was lucky that I had a Pak SIM with data on it as I landed. I was using that to monitor the position and at 16640 I just took a hedge (noted below) which I’m now going to struggle with to get rid off. Handling a single side of a trade is a LOT LOT easier than trying to handle a 2 sided one. Even when one goes into profit you can’t take it just in case it continues to profit further. As a rookie trader I used to do that a lot. This takes me back to the ‘bad old days’ but I’d rather not be there. Anyway I must stop otherwise I’m likely to do myself some serious injury in the ‘state’ that I’m in. US Nat Gas (UNG) Consensus injection is for 80bcf in tomorrows report. My sources are in the range of 30-60bcf. This could lead to a significant pop tomorrow. Taking a risk and going back in with my 1/3 trading amount before the report. I see little downside risk and possible 1-3% upside potential. If I am wrong and it breaks down sgnificantly, I am a buyer again, but price target will depend on price action. And the bulls back in control. Safer to wait for a bearish signal to short. This could very easy power back above 17000 on the Dow. The FED still has the power to convince the majority. Yes Krish, the reaction to the Fed ‘(in)decision’ could be all over the place. I’m going to remain hedged unless I can profitably exit both halves of my position. Ugh… meant to say ‘…exit both half of my position before the announcement’. Doubt if I get that chance. I hate carrying hedged positions. Haven’t done that in a loong while. Just a quick note to say that it looks like ‘another one bites the dust’….on the triangle front. I was lucky enough to hedge at 16640 and save myself some serious grief. However now I haven’t worked out when to unload my hedge and I’m too tired to focus. Friday afternoon, as the market has its little moon-shot. If the bear market has indeed started I expect multiple 100% retracements which will really annoy the Bears. Timing shorts is going to be difficult but the payoffs will be huge if done correctly. The 100% retracements have been happening since February 2015, some to marginal new highs, some not, but none making much headway. If this is the bear, you’ll see 60-80% retracements, but no more. 100% retracements implies sideways price action. Plan to add short or hold till we reach 2010 or higher? Summary: staying full invested until Fed announcement. Cash or short at Friday open, no equities until Tuesday. Valley, don’t tell me you got short in the run up following the Fed announcement. If so, that’s just plain great timing from your system (assuming markets don’t turn back up tomorrow, of course). B.I.N.G.O.. Not short but cash, next best thing; and bought a QQQ put at top for a quick 50% gain ($50 on one contract). System works well as simple directional indicator, but when used with fading intraday high prices, or fading intraday oversold prices, it really performs well. Today I faded Fed rally as I knew tomorrow system was bearish. If, however, tomorrow was bullish would not have faded. My bet for tomorrow: Fed raises and immediately after announcement gold prints below 1100 and ES contract drops in E-wave to 1930-1940. But this proves to be short term bottom with wild reversal before end of session (thanks to language used). It’s mad that the markets will become volatile through the words of modern shaman. Will Yellen produce any chicken entrails? GM, I just noticed that you think that the Fed’s rate decision is on Friday. It’s actually Thursday at 7pm UK time. Just added my 2nd position in a 3x short Ftse 100 ETF. As I can’t trade US short ETFs I have to get in during UK market hours. If there’s a pop post-nonsense that last into tomorrow morning, I’ll add some more. (Most bears have been squeezed these past couple of weeks, and longs are now likely to be jumping on board. As usual, the market appears to be frustrating with its chop). BTW, the USD index looks like a great big bull flag to me, looking for that to have its next leg up imminently, hammering all commodities in the process (gold maybe the exception). GM, a while back I looked into 3x ETFs and one of the things I found during my research is that they are not very good for medium term investments. Apparently it has something to do with the way they are callibrated daily. Over a period of months they start to lag the index they are tracking or something like that. Basically it was an expensive medium to long term investment vehicle. Fine for a few weeks swing trades. My research was in respect of US ETFs but the same probably applies to UK ones as well. Any way just something you should be aware of. Thanks p, yes I’m aware of the decay, but expecting (hoping) to be in and out within a week or two. Thanks Chien Jen. Youve posted both oas and margin debt on the same chart before. From what ive gathered the mkt begins dropping before oas peaks but margin debt peaks first. Declining margin debt coupled with oas beginning to run up looks like the signal of interest. Thoughts? Please be careful with likely significant whipsaw moves later. Specie, if there is a ‘pop up’ following Yellen’s yelling within the hour, I suspect that would be the ‘throw over’ for all these ascending triangles and wedges before the reversal. Buy the rumour, sell the news type scenario. OK the bulls have decided to go utterly mad with the DJIA at 16924 right now. If I was in the UK right now I’d be taking OFF my hedge here. However at 10 to midnight where I am it is not a good idea. So, I’m hoping that most of this move will still be around when I awake (about 4 hours ahead of UK) and can nursemaid it through. I really don’t see it going much higher immediately. Personally I’m looking for a complete collapse but if that doesn’t happen then a retrace to around the late 16700s is a definite possibility. Haha!! Wishful thinking on my part for the DJIA to hold up at the 1692x level. I should have just followed my hunch. Never mind I never expected my hedge to be easy to get rid off anyway. I’m going to let it do it’s thing and look at it with fresh eyes tomorrow. Still! !….missing a 120 point round trip last thing at night is a bit of a bummer. S&P had a go at reaching the 61.8% Fib today, just fell short, now just above the 50% level. Shorting would be so juicy if 2040 is reached, but I wonder if everyone is waiting for that level, and whether it will be reached? Maybe 2020 will be it? Whatever, I see 1700-1800 within 2 weeks. The other person that deserves a ‘shout out’ is Valley. His PALS system identifies, bullish, bearish and neutral days and those have worked out very well indeed for quite a while now i.e. not just blind luck. Thank you, Purvez. My 1.5 neurons salute you. Ouch you lost a quarter of your neurons? That is NOT good news. I’d offer to lend you mine but that would just bring the average down for you. Schizoprenic market does not know how to react today. If Fed was still in control I would expect a strong rally. Not seeing that. Next week of trading will be interesting to see if a direction appears. JaFree, the market makers DO know. That last half hour pop up and down was to get most of the stop losses. Now, I’m going to suggest that, they’re going to frustrate both sides by settling down about midway between the pop and drop for a day or two. The Fed never were in control and never will be. If they did have any control we wouldn’t be in the midst of deflation and interest rates wouldn’t be at zero for a decade with zeo wages growth. The Fed today lost any last remaining credibility they had left. The only thing supporting these markets are the delusions created that central planners have any control. When confidence finally abandons the financial markets and the massive over leverage due to the explosion in ETF’s unwinds there won’t be any markets left worth investing in other than gold and silver. Stock up while you still have the chance to buy physical at this ridiculous level. Go and study the intra day charts of the last week. This has been nothing more than another orchestrated “pump and dump” by the big money. They know the jig is sll but over! Spot on with your view of the Fed Allan. I would love too see them announce QEX in due course and the market tank on the announcement in panic. Game over at that point, over to the ECB to bid for gold via monetary ops. GM, mate the Central planners have just lost thier last chance to reload before the next crisis. They should have been raising 18 months ago but instead preferred to wait and watch whilst markets continued to rise to aburd valuation. Even Yellen observed the absurd valuations 18 months ago and yet sill did nothing. As such rhey lost thier opportunities amd once Central bankers have shown that they are still way behind the curve and totally inept at reading or reacting accirdingly. Mate, the next round of QE will have the reverse effect on the SM and will propel Au/Ag to astronomical levels. My view Allan is that the market leads the Fed, and mid-long end of the curve has been edging lower & lower, as well as break-evens. The Fed is simply trapped, it possibly wanted to raise rates, but knew that the market was going the other way, seeing a deflationary recession dead ahead (now arrived). It is now wedged between a rock and a hard place. The next couple of years will be fascinating to watch, all manner of S to H the F.
Nice couple of days for HUI also, is the bottom in? Exited SPX near top after Fed Meeting, PALS was neutral today and bearish tomorrow so faded the rally. Market is down 2% so far. Whew! Monday should open lower and then Tuesday to Friday will probably retrace some of the losses. You said QQQ put, did you buy close to when spx 2010, Did you already exit, I though you want to hold until monday day close. Did you qqq puts on weeklies or on indexes. I dont trade option during option week you will get it assigned and be in big trouble,thought I tell you based on my past bad experience. I did some spy index trade which will not get assigned as no dividened on it. I had 3 contracts on spx 1970/1920 put spreads. Hi Bill, I entered and exited QQQ put in 20 minutes, got lucky on timing. I only buy put or call never sell them so can not get assigned. I am sitting on hands today as PALS is very negative, tho’ if we get a 2% or greater continuation sell off I will reeenter. Next Friday is Full Moon Friday and expect market to move up into that day probably starting on Tuesday. Great trading Valley!! Congrats, your PALS system is working well. G’Luck. Valley you are doing just fine without EW. However it does occur to me that I should perhaps be more generous with my thoughts on EW here….other than a run of failed triangles LOL!! The reason I haven’t been ‘generous’ is because I day trade and am mostly counting 5 minute waves. I don’t believe that many here are so deeply involved and I’ll just end up cluttering the board because my ‘counts/views’ change quite a few times every hour. Any way I’m going to try and post some longer time frame ideas here. 9/17 5:38 pm Today’s high 2024 is close to my next price target of 2033 and also close to Sean’s first price target of 2042. 9/22 is the time target for a high but I am being cautious here as targets are close by. Peggy, what are the short term targets after the expected turn down on 9/22? SPX 2021 is 62% retrace and looks very much like the B wave turn point. Added short & freebie stop 2010. We had the final pop yesterday I think and a great reversal to show the FED investors are losing the faith! Would expect a swift move down if we are going to get a crash in september/october. I’m short dow at 16670. “The Fed never were in control and never will be” I disagree on shorter term time frames. Market Psychology gives the Fed power, if you do not believe that, you will get slaughtered in trading. Longer term, the market forces eventually win and we can agree. Right now, it appears the market psychology that gave the Fed power is fading. That is my point. That is the meaning behind the Fed is losing control. Nonsense. They *appear* influential in bull cycles (but that’;s merely the cycle), their impotence is revealed on the way down. Up or down, the Fed is irrelevant. We can agree to diasagree. I just have to wonder how you could trade the past 7-8 years believing that they have no control on price action. You don’t even realise the inherent contradiction in your *belief*. it’s human speculative behaviour, especially at bank level, influenced by the solar cycle. If you don’t grasp that, why are you here? Try reading Jeff Snyder at Alhambra to gain an understanding of banks and wholesale global money. The Fed don’t even enter the equation. Well we can agree there is a contradiction for sure. I actually completely agree with this statement. So if they have no market psychology affect what so ever, how is this statement even credible? I do not like central banks period, but to disregard their affect on short term periods of time is foolish. Good Luck if you truly beleive that. I mean you can say whatever you want, but clearly you make moves based on their actions, so you MUST have some belief that they control moves one way or the other. I am here, because I am a weather nut and found this site reading about solar spots. I like the ideas here and I find the conversation interesting. I weight it according to my experience in the market. It is a small weight, but it is a factor non the less. Please, try to stay with me. Why are you quoting Allan when we’re having a debate? Do feel free to try again with a response to my last post, otherwise we’re done here. …you’re just creating fiction, as that statement is totally contrary to every view I’ve ever expressed here (or anywhere). Care to explain how you reached that conclusion? Go on, it’ll be fun to watch you try. I suspect a golden silence will descend. You’re a slippery character, last time I will waste my time with you. There is nothing slippery about facts. Your actions speak louder than your words. What I find most humorous about you and I, is quite alot of our beliefs are the same. Certianly concerning central banks, currency and the idea that Gov. intervention in markets is generally a bad thing. Anyway, the conversation is really only about a belief, mine and yours. We don’t agree, about a small detail. Nothing really wasting time over as you said. Oh sorry, I was quoting Allan on the first statement, but you responded. I hope I met your standard for staying with you. Slippery folk like you put words into others mouths and expect not to be called on it. You also ignore valid arguments, unable to refute them. Facts are treated as inconvenient. You’re the worst kind of blog poster, lacking in integrity and intelligence. GM, I decided to add to your initals contest. Great call by those who went short before FOMC. Always appreciate a good call. Just looked right to me. I’ve just added my 3rd layer of shorts on the same ETF, (1pm in the UK) pondered waiting for a bounce at US open, but rather be on board now. I reckon we go 5% lower than the August dip, low 1700s. Of interest to me today is how gold stocks perform. Gold & silver up nicely, oil down, the perfect combo for gold miners. But stocks down, so will gold miners get dragged down too? If not, I’d say the tide has turned for HUI. I believe the Fed has the ability to manipulate speculative markets in the short term. PPT? There is also the powerful tool of ‘jawboning’. Long term I agree wGM so I think you are both correct. Rather than *belief*, how about providing some evidence? We just have business & credit cycles. This blog was a revelation for me, the final piece of the jigsaw, what causes business & credit cycles? It’s the sun and moon. We had cycles and bubbles long before the Fed even existed. Who did the *followers* blame then? But, the Fed’s voodoo nonsense has permeated deep into the minds of many. So easy to disprove, as they NEVER stop the busts. I agree with those who expect the Fed to lose its charter in the years ahead, as the US govt goes bust and the USD collapses. They’ll pin the blame on the Fed. May sound mad, but remember where you heard it first. (I have to credit M Armstrong for this one In honesty, but it fits with my long-term view). Evidence on this subject can support both arguements. It has to be belief. You demonstrate: your fantasies about my actions; your inability to make a coherent point; and also an ability to construct a coherent sentence. All in that sentence, so good job. BTW…in all your jabber about Nat Gas and oil, never once have you even mentioned the dollar. Fundamentals will prove irrelevant when the dollar index is at 130. Tough eh. “But, the Fed’s voodoo nonsense has permeated deep into the minds of many. See…. we COMPLETELY agree here, but that statement completely supports the psychological control idea. Again, what exactly are we discussing here? It’s a minute belief area for which we are discussing semantics for which you clearly take into account in your actions. Not really worth our time. It’s not going to change your actions or mine. The bottom line is that “the Fed’s voodoo nonsense” is on trial right now and the verdict seems to be that the proponents that provided the temorary controls are now questioning their actions. It is pure perception. ie. Control given by perception. the wiser, meaning folks that never believed in their control will benefit. Hopefully both of us. Holy Cow, The volume is strong for this early in the trading session. This should bring a very interesting end of day. Friday down on high volume. Hmmmm. Watching closely. today is the start of the main puetz crash window! Specie, yes I did forget the exact time, because my strategy right now is cash waiting on crash. But thanks for the reminder. I am definitely glued to the markets right now. As I pointed out 4-5 different analysis on this site led to the next 1-2 weeks of a time to begin the next fall. Very interesting time right now. I appreciate your input. i’m sorry, i wasn’t on drugs that day but it may have seemed like it. The full moon is 9/27. the window is therefore 6 days before to 3 days after that date. i understood it to be calendar days at first but was further informed that it is trading days. that makes the window 9/18 – 9/30. Please may I ask an idiotic question? Can we have Puetz Crash ‘upwards’? in long term treasuries, VIX and gold. Hmmm you knew that isn’t what I was asking about though!! 🙂 It’s just that I could do with one of these ‘freaks of nature’ calls. Did you not manage to close your long hedge yesterday during the pop? Ugh GM being ‘home’ has it’s draw backs. I had a ton of visiting to do today and by the time I got back …. well you know what had happened. Still it’s only ‘opportunity’ cost. I just have to now make sure I get the lower leg profitable. Then I have to make another 100 points to the long side to be overall profitable on the trade. This is why I hate hedges. I hope you can bank some coin, and at least avoid a loss. I’m going to give it a go on Monday…banking coin I mean. Now that I’m rested the jet lag has kicked in. It’s 1am here and I’m wide awake. I wish that had been the case yesterday!! Travelling West to East is a real bummer. I hardly feel anything the other way. Sometimes I think the fates are lined up against me. Thx stormchaser80. How’s Trending Wave’s doing? Be nice to see S&P 1900 taken out today. HUI up a little, nice to see. Europe leading in the Solheim Cup. Now you are just being greedy GM!! Well after all the wait I suppose us bears have a right eh? Below SPX 1820 sits C=A Fib 1753ish. Crash with mash please. JH, two questions, which I think are important because it determines the confidence of the bears to hold their shorts despite whatever the market throws at us. 1) Is there a level of money printing where you will turn bullish? For example, if QE is in the order of $10T and say the debt is forgiven, I personally think stocks have to go up because the base currency has dropped in value. This has never happened in the US before, but certainly in some African nations. It would also solve social security and other pension issues. 2) If 10 year Treasuries yield 1.8%, but the S&P 500 dividend yield is 2% and earnings yield is > 5%, assuming all of us agree the uber bearish zero growth for 20 years scenario, why would a pension fund sell stocks to buy something that still yields less over 10 years. Negative growth over 10 years seems implausible — perhaps that is the fallacy. the last time stocks dropped by 50% long term treasury bonds rose in value 20-30% in a short period of time. I remain quite the bear, but I am setting up a trust for my children, and therefore have the question before me — is there something I can buy and just forget about for 30 years? My honest assessment is that S&P 500 still has a reasonable chance to come out ahead for such a long horizon. As a trade, I do think stocks can fall -50%, but this time around, I think risk parity funds with levered bets will lead to drops in bonds too. John Li, haven’t you answered your own question? If you know the S&P is going to tank for a while then just wait before starting the trust. That’s what I would do….actually that’s what I’m doing in a round about sort of way. I have a ‘down bet’ on the market for my kid and when I feel it’s the bottom I’m going to switch sides. Part of the funds I hope to use to give him a mortgage free residence and the remainder to give him some income for life. Now let’s see what life really throws at us!! Haha!! I like GM’s clearly ‘reasoned’ response. No ….. I actually DO LIKE GM’s response… reasoned or not. The actual physical stuff though, no ETFs. We’re heading into a repeat of the 70s on steroids. 30x from here, minimum. (It did 22x in the 70s). Stick it in a vault, sit back and relax. GM, you make my wife very happy. I’m beginning to worry about GM. That’s the second lady that he hasn’t met (I’m guessing here) who he’s made ‘very happy’. If your trust will be of significant size you really need to diversify. I like the physical gold idea, but you would really want to spread out the risk. One very successful investing method that is well tested is the Dogs of the Dow. Basically you buy the highest 10 dividend stocks of the DOW and re-adjust every January. This does require action of course so not exactly a forget about it strategy. There are ETF’s that will do it, but you will have to pay fees of course. Reasonable fees I am sure. It is a low risk market beating strategy. John Li, glad to hear that. I have many more, feel free to drop me a line. Thanks for the weekend reading. I have a question for Alphahorn please. Did you manage to handle the sudden reversal from the ‘false break out’ of the triangle? That was really tricky and I would be very interested in knowing how you knew to manage that trade please. I was long spx at the breakout upwards point. I managed to just about break even by the end of the day. Yes pulp, the surge and drop were bad enough but then today’s action capped it all. I wasn’t around to see today’s action but looking at the 5 minute graph it didn’t look like panic so, I for one, would not have thought much about it until it was way too late to recover. A very good stealth move indeed. Big end of the day down volume (DOW) and still going. Likely to be biggest volume since the Aug 24th mini-panic. This will set up for a very interesting Monday. Big Volume (DOW), but it is on a triple witching day. VIX did not confirm panic in my view, but we will see how next week goes. The pattern looks very weak for bulls, but I am not convinced yet that we are teetering on panic. I sincerely believe that we are at the beginning of very powerful move that will take us to SPX 1550-1570 zone, where it can find some support close to 2000 and 2007 tops. That would be only 38.2% retracement of 2009-2015 bull market. I am short with stops at yesterday’s highs and I am not going to close them before 1570 is reached. That may still happen this year. Gold should target 1500 in the meantime. Eventually, this bear will take us lower then 2009. I am really afraid of what will happen during this bear market, this is finally the disillusionment phase. Summary: Seasonals are negative all week. However, declination, distance, and phase are all positive, especially after Monday (Tuesday to Friday should benefit from Full Moon magnetic effect). Also we are post Venus inferior conjunction which usually sheds some good energy into the next month, and approaching Mercury inferior conjunction which until day of (9/30) has added good energy last few years (tho’ in bear markets the reverse). I exited long at Thursdays rally. Reentered long mid day Friday and am down 1% at the moment. As I am nicely up for the year, and see some upside short term will remain long until next Friday, unless we get overbought sooner than that. After next Friday, post Full Moon and post Perigee is time to be in cash or short. @valley looks like PALS gonna let you down, next week may be worst of the year! Storm, I would give high odds that we rebound by Friday’s close to two percent above this Friday’s close. I am so certain of it I would consider making an options trade using calls but they are too expensive.